I elected to skipper my first Channel crossing from Gosport to Cherbourg. My reasoning was that this would be a daytime passage whereas skippering a first Channel crossing at night would be pushing it. Since acquiring my day skipper ticket I’d logged around 1,300 miles – a good proportion of that as skipper. So I felt ready – what could possibly go wrong? The first step was to prepare my passage plan, which was a great opportunity to bring together all the theory learning into one place. It also brought home that this was a much bigger trip than say from Yarmouth to Poole given we would be out of sight of land for the majority of the crossing and subject to potentially significant tidal streams off the Cherbourg peninsula. Passage planning, as well as being a legal requirement, is a great way to force you to take a step back and look at all the aspects of the journey. I planned our arrival for late Friday afternoon so we would be in good time to sample the moules frites at a local bistro. That meant an early departure of around 0300. The tidal streams exactly balanced out (14nm west followed by 14nm east) assuming an average boat speed of 5kts – so the course to steer was a very easy calculation at 198T. The crew met for dinner the evening before and, after a passage plan & safety briefing, we tried to get our heads down for a few hours kip. The crew incidentally comprised one Yachtmaster, four day skippers and a competent crew. I awoke about 5 minutes before my alarm, which is always nice, and we were away pretty much on time slipping at 0305. I had noted on the passage plan that pilotage out of Gosport to Bembridge would be via local knowledge since I had come in and out of Portsmouth many times. Not at night though, and I was suddenly aware that this was a careless omission, since I would have needed to rely on night light characteristics if it hadn’t been for excellent moonlight visibility. As we rounded Seaview a yelp from the helmsman could be heard and the rest of the crew were up in flash to see a few dolphins darting in and about the bow. Or were they porpoises (probably, but dolphins sound cooler). We arrived at the Bembridge Ledge ECM at around 0500, about ¾ hour later than expected, so we were already going to have 1 hour less easterly tide on the first half of the crossing. As can be seen from the logged track we made 160 during this phase of the Channel crossing placing us 20 miles east of where we should have been when the tide changed. During this phase, we were also struck by our second unexpected factor – seasickness. Two of our crew became completely debilitated and we were even concerned that one of them was dehydrated. This meant our watch system (2 hours on, 4 hours off) soon fell apart. The remaining four had to deal with the increased workload. Initially, This wasn’t a concern as we hadn’t yet realised we would be so late. On reflection, I should have redefined the watch system and also allocated the comfortable bunks to those crew who weren’t ill. It became essential that those who needed to be as fresh as possible got some decent rest when they were off watch. Asking the remaining crew to rest in the forepeak with the boat slamming down or straining to stay on the windward saloon seat is a worse option. I myself had never been seasick before and although I was in a far far better state than the other two, I was sick a number of times. Thankfully, I felt okay afterwards and was able to lie down and rest during my off watches. Looking at charts though was a struggle. Mike spotted more dolphins and estimated a pod of around 40 had come over to investigate us. It would have been pretty special if I hadn’t been feeding them at the time. Around 8 hours into the Channel crossing the furling line broke releasing the entire headsail. We had set off with a comfortable breeze and full sail plan but later hove to in order to put a couple of reefs in the mainsail and we also balanced the headsail. What appears to be a poorly designed Harken furling drum was causing the line to chafe on the drum when it was reefed in. I went forward with Mike and bent the line back together whilst sailing downwind. Clearly this lead us further away from our destination (point A in passage track). This was where I made our first major change to the course. We were way off course and with the consistent wind direction nor the sea state relenting, it was looking like we would be driving further south if we continued. I don’t know whether this was the optimal decision. My reasoning was that if we needed to sail against an easterly tide it would be best to avoid it where it’s much stronger near the Cherbourg peninsula. We tacked (at point B) and sailed west for around 20nm with the tide – again as close to the wind as we could manage. Towards the end of this tack we were being driven further north so we resumed on our original course (point C). This phase of the sail was nothing short of a long tedious slog. We knew we were still 30 miles way from Cherbourg, which was demotivating (and frankly depressing for the two down below with seasickness). It wasn’t pleasant down below – I slipped on the wet floor catching my life jacket on the heads door handle and breaking it. I was also feeling the cold but not enough to risk crawling around on the saloon floor trying to find my thick beanie amongst all the detritus – I’d rather be cold than throw up again. The wind did eventually (point D) veer enough for us to hold a reasonable reach for the final 15 miles in to Cherbourg. It seemed to take forever for the town to get any bigger but eventually we honed in on the lights and spotted various cardinals along the eastern shore and then the buoys marking entry to the eastern entrance. Once we were inside, John & I went forward to rig a new furling line so we could pull in the headsail. This was accomplished painlessly as we made our way across the inner harbour and before entering the Chantereyne marina for a simple berthing. The Channel crossing took us 22 hours and we covered 114 miles over the ground – 10 of those hours were at night. We had no log for the journey but I estimated around 100 miles through the water, perhaps a little less. The following morning we had a well-earned shower and café breakfast (where, strangely, we were encouraged to bring our own croissants). We then returned to the boat to get it ready for the evening sail. This included retrieving the radar reflector that had detached from the deck line and was left swinging from the masthead. 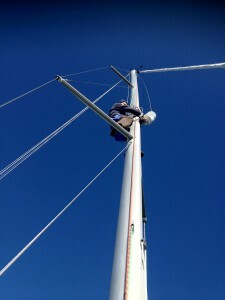 I hadn’t been up the mast before, it was sunny and windless so why not. Our return journey was far more enjoyable. I enjoyed stepping away from responsibility of skippering to enjoy sailing as crew. The wind was westerly veering northwest and our point of sail started as a reach becoming a beam reach. We elected to close reach rather than close haul at the start and sacrificed a little course in favour of speed – reducing the effect of the tide. Visibility was good and our only real concerns were properly tracking several close groups of commercial vessels making their way between the two TSS zones. Wind had a dramatic effect on our trip – it’s amazing how much difference a favourable wind makes & vice versa. Although the forecast was for W/NW, in fact it was SW/W so it turned out to be a hard slog with the sea state slowing us down dramatically and thereby increasing the effect of the tide. Close hauling maximised the lee effect, further compounding the problem. As well as entering our position into the log hourly, I should have plotted these fixes directly onto the chart from the outset. We started doing this when we knew we were off track but I might have had the option of doing something about it sooner. I’m not sure we would have done anything different and not having a working log compounded the issue making an accurate CTS difficult. We could have elected to go somewhere else, of course, but once you’ve bought into the trip it’s hard to change your mind. Seasickness – I will never undertake another long passage without taking Stugeron from 24 hours beforehand. I had reasoned that if I was going to be sick it would be at night due to lack of horizon but in reality the sea state got me. Be ready to revise the watch list if the crew get sick – ensuring that the crew still functioning get priority on bunks during their rest periods. Get the boat and surplus kit stowed ready for passage – on the return leg we put everything we wouldn’t need in our bags and stowed them in the forepeak cabin. This left the saloon relatively clear which would have helped on our Channel crossing. Since this first Channel crossing, I’ve had many more enjoyable experiences including this tale on a single tack, visiting the stunning harbour of Honfleur and this glorious night passage. Log entry. 28.9.12 Nomad 1 Jeanneau Sunfast 37′. Skipper. Gosport – Cherbourg. F6 occ F7. Rough. 100NM tidal. 10 night hours. Log entry. 29.9.12 Nomad 1 Jeanneau Sunfast 37′. Crew. Cherbourg – Gosport. F4 occ F5. Slight. 82NM tidal. 6 night hours. Excellent and very accurate account Paul. Challenging 1st crossing – but as Skipper you handled the conditions and situation well. Although it was long and tiring, I never felt that we were in any danger or outside our comfort zone.